Hello everyone! 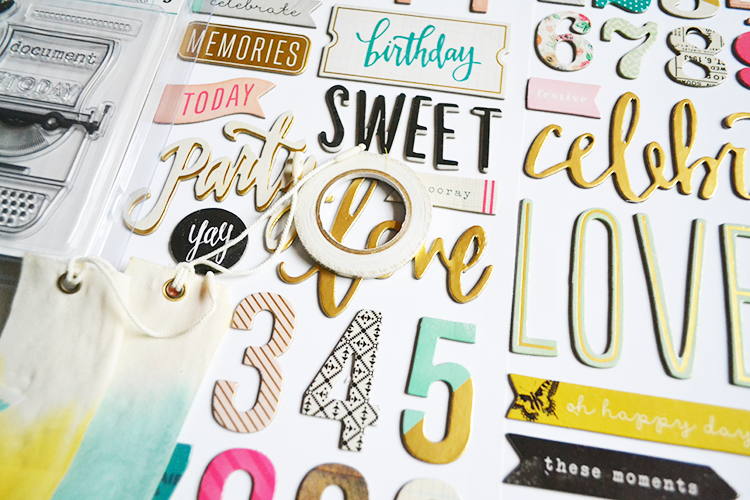 I’m so excited to share my first kits I received from the Scrappery since joining their Creative Team! 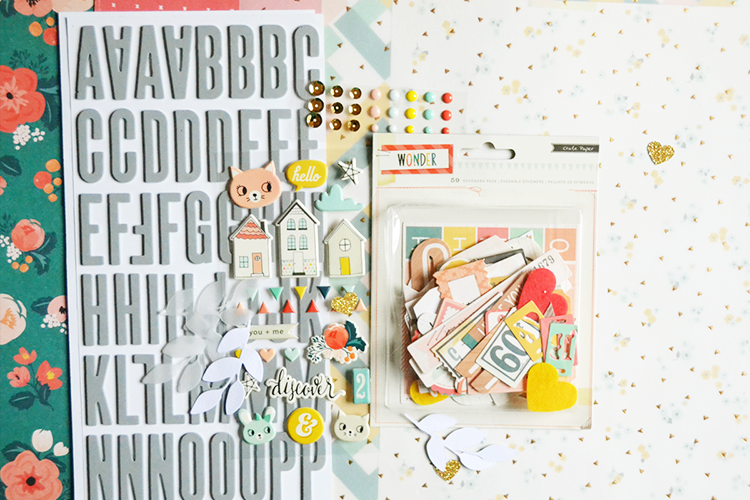 I got the TSK (the scrappery kit) and the BPK (bits and pieces kit) and they are so gorgeous! Let’s start of with the BPK Bethany kit. This kit is so lovely and feautures some truly gorgeous products. 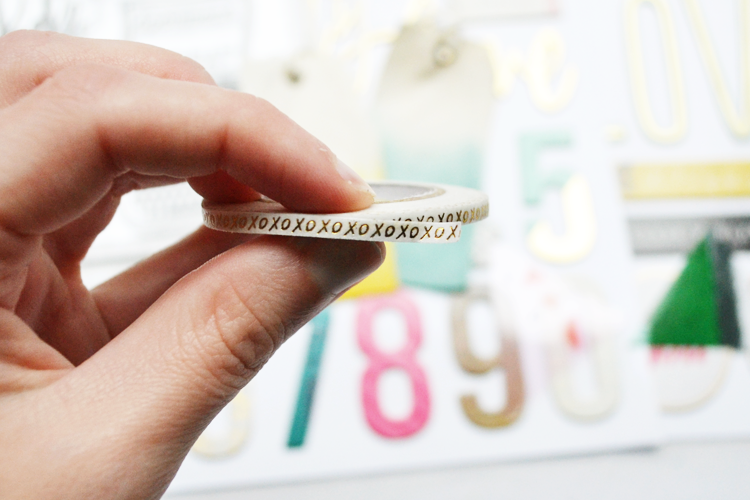 Here is a little closeup of the roll of washi tape that comes in the kit, it is a thin gold foiled washi tape by Little B. Isn’t that pretty? 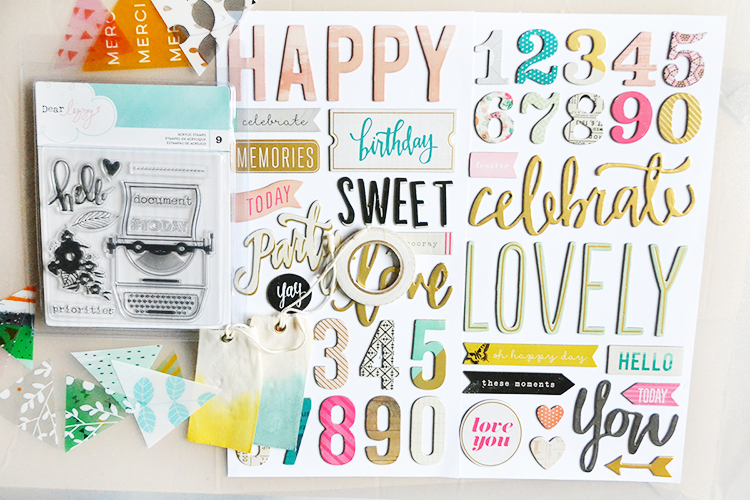 The kit also comes with these word thickers from the Maggie Holmes Confetti collection. I’ve had these before while I was working with that collection but I am excited to have another pack because they are beautiful! 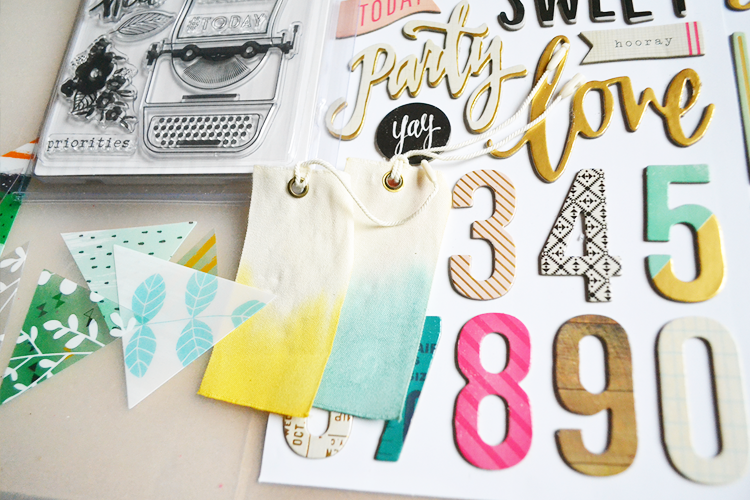 You get 2 ombre tags by Pinkfresh Studio from the Happy Things collection. You also get 1/2 pack of these lovely acetate triangles which also come from the Pinkfresh Studio Happy Things collection. 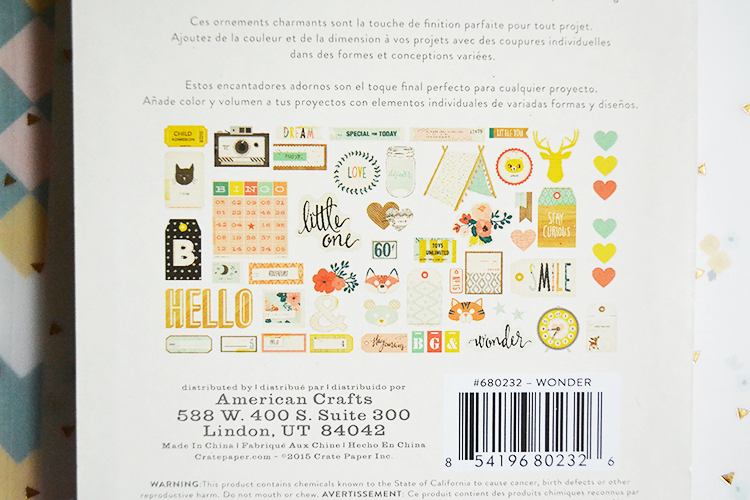 I am also really loving the Dear Lizzy Stamp set that comes in the BPK kit, when I ordered the collection a while ago I didn’t buy it so i’m so happy to have it now! There are still some of these kits in stock so go over here if you are interested in buying it. In this kit you get 6 pieces of paper with 1 specialty paper included. I am absolutely in love with that gold foiled vellum piece. 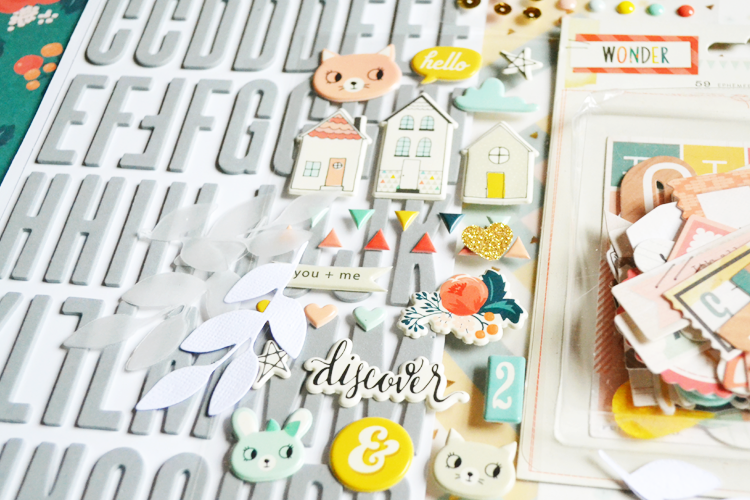 You also get a pack of the gorgeous Crate Paper Wonder ephemera. If you know me then you know I love Crate Paper so I am happy about getting an extra pack of their ephemera and this one has a ton of pieces in it. You get a pack of grey foam thickers which are, if I did my homework correctly, from the Maggie Holmes Styleboard collection. I am also kind of excited about those die-cut leaves that come with the kit; 2 of them are vellum and the other 2 are regular cardstock. All in all I can’t wait to start creating with these kits because they are just gorgeous! You should definitely hop on over to the Scrappery’s website and check them out here. Their kits are great value and are also affordable for those who are not from Australia since the shipping is not expensive at all.